It's 1925 and Donna Delle Philp's legs have grown too long for the family's old washtub. But with her parents busy making ends meet on the farm, it's up to Donna to find a solution. After months of toil-and some help from her brother and sisters-she earns enough money to buy the family a real bathtub. This warm, true story illustrates the value of a dollar and what can be accomplished by working together toward a goal. Loaded with primary source material. Wonderful addition to an American history, math, or economics curriculum. 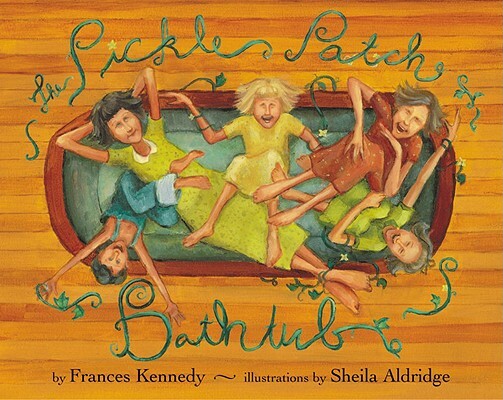 SHEILA ALDRIDGE has illustrated four books, including The Pickle Patch Bathtub. She lives outside Atlanta, Georgia, with her husband. Donna Delle's daughter, author FRANCES KENNEDY, lives in Dubuque, Iowa, with her husband and within driving distance of many of her own grandchildren. This is her second children's book.